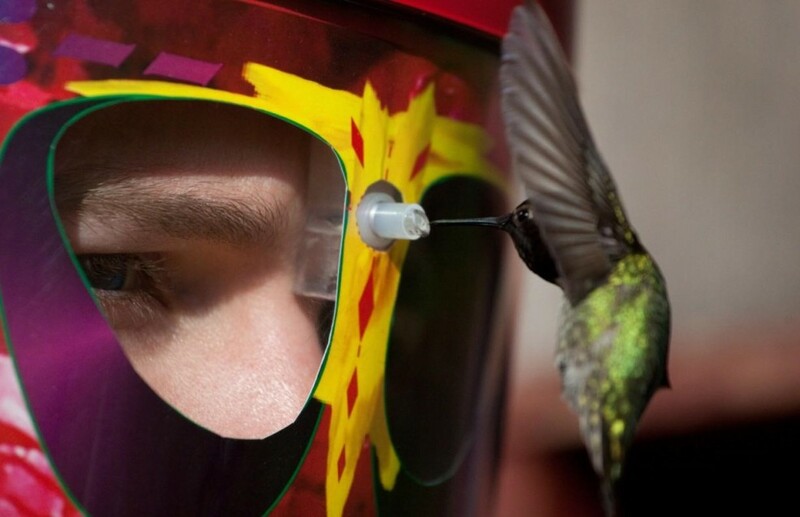 Wearable Feeder Mask Lets You Get Face to Beak With Hummingbirds | OhGizmo! Calling all lovers of birds! A contraption called the ‘Eye to Eye’ is now available so you can get up close and personal with hummingbirds while you feed them. It’s basically a wearable bird feeder that lets you literally come face to beak with the birds as they feed. A miniaturized feeding tube is embedded in the middle of the mask, which means the birds will be in your face while it feeds. For $80, you’ll get two feeding tubes, two laminated inlays, and one face shield (of course you need one.) Is it worth it? Is it not? That depends on you and on the experience that you’re hoping to get out of it. You can get the ‘Eye to Eye’ mask here. Looks like there are no shields over the human eyes. Ooops……. Kinda need those with those needle beaks.